Eli’s Lesson is a family drama starring Jack Palance (City Slickers) and Kenneth Welsh (The Day After Tonorrow, Miracle) broadcast on CanWest Global. Eli Hoffer (Robbie Bowen – One of Our Own, In Cold Blood) is a young Hutterite boy who dreams of one day becoming a pilot. But the strict confines of both the traditional Hutterite culture and an uncompromising uncle (Kenneth Welsh) leave little hope of that Dream ever coming true. So, in a desperate attempt to hang onto that dream, Eli flees the security of the colony and ends up in the big city hopelessly trapped by a gang of street kids on the strangest night of the year – Halloween. Bent on pulling off the perfect little crime, the gang makes Eli an unwitting accomplice to their plan, propelling him into a confrontation with a mysterious war vet (Jack Palance). And in a moment of truth, he discovers the power of friendship and forgiveness…and then his dream really takes flight. 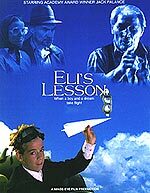 A Minds Eye Entertainment production, Eli’s Lesson was directed by Peter D. Marshall. Producer is Kevin DeWalt, co-producer is Rob King.